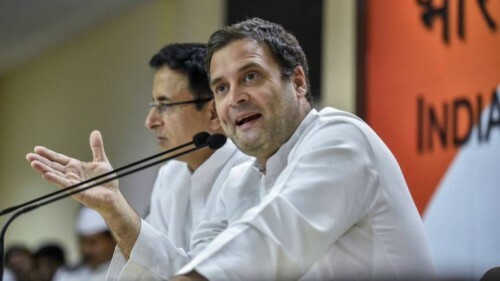 Bokakhat (Golaghat), April 3 (IANS) Congress president Rahul Gandhi on Wednesday said that while the Prime Minister Narendra Modi led BJP government has failed to deposit the promised Rs. 15 lakh into everyone's ban account, he has given Rs. 30,000 crore to an industrialist friend. "Modiji came here in 2014 and announced that everyone will be given Rs. 15 lakh in their bank accounts. However, not a single penny got deposited in last five years. That was a lie. I am assuring that 20 percent of the countrya's extremely poor people will be given Rs. 72,000 each every year. The amount will be deposited in the account of the women of the family. This is truth, we don't lie," he said while addressing a public rally in Assam's Bokakhat area on Wednesday. He also appealed to the people to ensure victory of the Congress candidate so that the attack of the RSS on the language, culture and history of Assam could be stopped. Randhi was campaigning for Congress' sitting Lok Sabha MP Gaurav Gogoi, who is contesting from the Kaliabar Lok Sabha seat for a second consecutive term. "Narendra Modi has started asking questions as to from where the money will come. I am going to tell you from where the money will come. Modiji has given Rs. 30,000 crore from the Indian Air Force to Anil Ambani, we are going to get that money and distribute among the 20 percent extremely poor people of the country," he said. Terming the BJP government's effort to implement the Citizenship Amendment Bill in northeast as an attack, Gandhi said that the Congress has kept its promise of opposing the Citizenship Bill. "The CAB is an attack on the culture, thought and Independence of the people here. We stood by the people of the northeast during the CAB protests and ensured that it is not passed in Rajya Sabha," said Gandhi. Attacking the BJP further, Gandhi said while Modiji had assured to create 2 crore employment opportunities, the country is at present witnessing highest unemployment rate in 45 last years. "He promised Achche din ayenge but acheche din chale gaye. He (Modi) terms himself as chowkidar, but we say chowkidar chor hain," said Gandhi. "Modiji imposed Gabbar Singh Tax, which is affecting the small and medium size businessmen across the country. The moment our government comes we will abolisg the Gabbar Singh Tax and implement easy and minimum GST. Referring to Nirav Modi and Anil Ambani, Gandhi said that they had not created any job for the youth of the country but taken out poor peoples' money. "The Nasik and RSS is attacking the history, culture and language of the people of the region. It must be stopped by defeating the BJP and voting for the Congress in the Lok Sabha polls," he appealed.